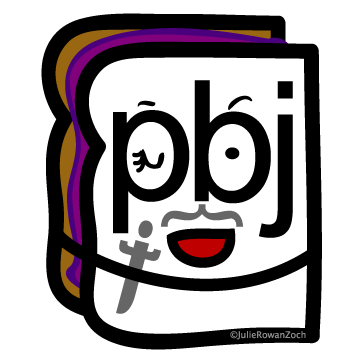 Sir PBJ strikes again! 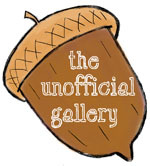 (More details on the first post). 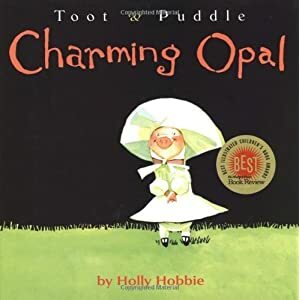 This time with With Toot & Puddle/Charming Opal by Hollie Hobbie, Little Brown and Company. 2003. And Opal really is charming! 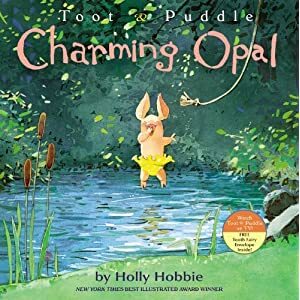 The cover is striking with it’s strongly contrasted black background and apple-green grass and Opal, cousin to Puddle the pig, decked out in puffed sleeves, an oversized bonnet and mischievous gleam in her eye. But it seems the cover was reconsidered and rolled out again in 2011 with one of the inner illustrations. A bit more personality? Perhaps. Hollie Hobbie’s master watercolors are stunning. As we are introduced to our main character stepping off the train at Woodcock Paddock Station the loose yet fine details are not photo-realistic, but convince us just the same of the normalcy of a well-dressed pig among humans stepping onto the sunlit platform. Each perfectly composed illustration tells a story worthy of framing and admiring on any castle wall. 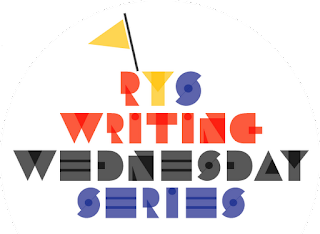 But the simple vignettes only loosely tie the plot together failing on their own to compel the reader onward. The plot itself is familiar – a loose tooth, it’s disappearance, the inevitable retrieval and the appearance of a tooth fairy. 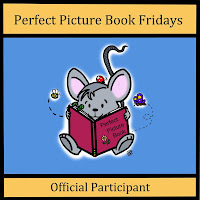 All these scenes are cute as a button, but the draw to turn a page relies strongly on the reader’s desire to view the next illustration – which is more than good enough for me!